MinimaList is a free Windows 8 to-do list app available under ‘Productivity’ section of its app store. 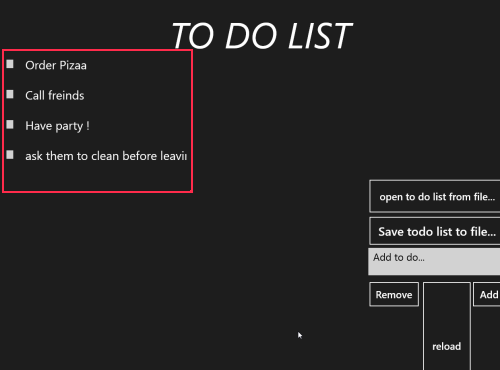 This to-do list app for Windows 8 lets you create and manage list of your daily tasks and to-dos. You can easily create as many to-do lists as you want such as list of grocery, or list of your daily activities which are to be done, so that you do not forget to perform any important task. This Windows 8 to-do list app comes with options to mark the tasks that you have done, shuffle the lists, add more tasks in a list, or delete the entire list. In order to mark a task as done, you need to swipe on it and it will make a green line on the activity. MinimaList has been designed just for easy management of you daily activities. Let me quickly bring out the main features of this to-do Windows 8 app below. Lets you create unlimited to-do lists. Helps you in easy management of you to-dos. Lets you reorder the lists by dragging and dropping or by using the shuffle icon. Lets you mark a task as done. Lets you delete the entire list. All the lists that you have created are given at the top of the screen. I just loved this Windows 8 to-do list app that comes with a big beautiful interface and lets you create unlimited to-do lists. As you launch the app, you will find a sample to-do list which helps you understand the MinimaList app properly. In order to create a personalized list, you need to click on ‘Create’ button. It’s very easy to download MinimList app in Windows 8. Also, check out our posts on ToDo List Apps, Encyclopedia Apps, and Day Planner App. Open this link in IE10. I repeat only in IE10. Click on ‘View in Windows Store’. Now, you can proceed with further installation steps to download the app in your system. In short, MinimaList is a good productivity app that encourages you towards performing your daily activities on time and reminds you about all your important tasks. Go ahead and download MinimaList app in Windows 8 now. Portable To-Do List is a free Windows 8 to do list app that helps you keep tracking all your important tasks and stay organized. Most of the desktop based to-do list managers don’t provide advance sync and the ones that offer such functionality are high on resource consumption. On the other hand, Portable To-Do List Windows 8 to do list manager is different i.e. it allows you to create a separate lists, export each in separate text file, and load them as per requirement. The generated text files can be copied to some secondary storage device and then opened, edited, and deleted on any other machine with Portable To-Do List installed on it. On launching Portable To Do List Windows 8 app for the first time, you will be presented following interface. Type the task details and click on ‘Add’ button. On doing so the entries will become visible in the top-left section. Next, click on ‘save to do list to file’ button after which you will be prompted about specifying a name and location for file to be saved. Well! instead of doing it the hard way it would be a nice idea to create new text file with entries separated by line breaks. 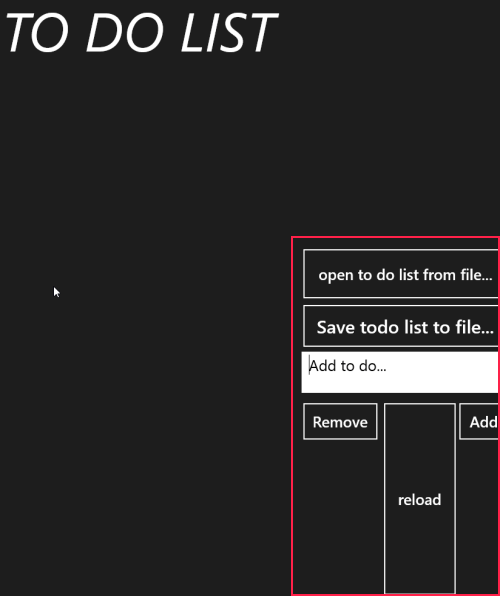 Then you can open the same inside Portable Windows 8 To-Do List app by clicking on ‘Open to do list from file’. Open a list at a time and then check or uncheck the check-boxes against each entry in your list. Also, check out our posts on To-Do List Apps, Day Planner App, and Sticky Note Apps. Portable To-Do List can be located in ‘Productivity’ section of Windows Store. This lightweight application is only 579 KB in size and requires no extra permissions. Using supported browser such as Internet explorer 10 or later, you will require opening this link. Then click on ‘View in Windows Store’ button after which you will be redirected to overview page in Windows Store. Next, click on ‘Install’ button.